Many people like antiques, but few like them so much as to build them themselves, that is, furniture that's new but looks old. Julius Mathies Jr. of Covington did just that, and here is his story. Click on the images below to make them larger. 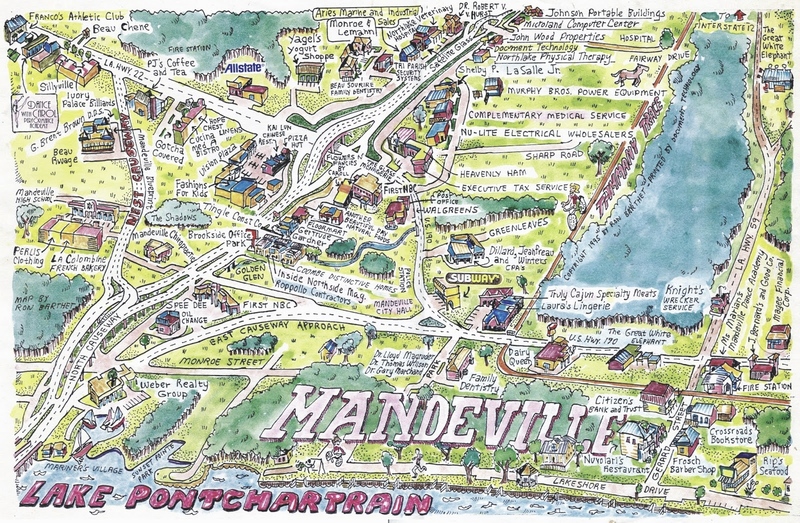 In 1995 I drew another Mandeville pictorial map, this one in color. Here it is. 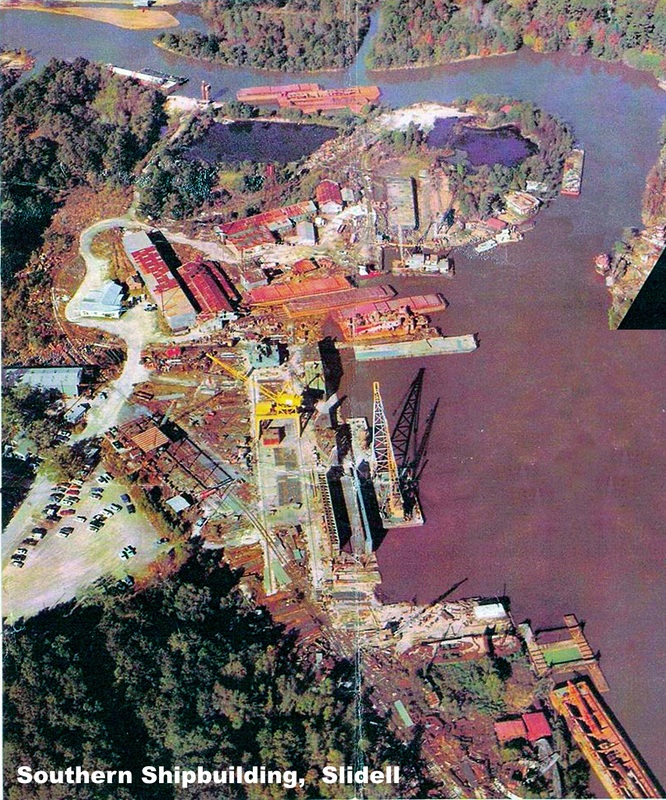 Over the years, St. Tammany has been home to several large shipyards. 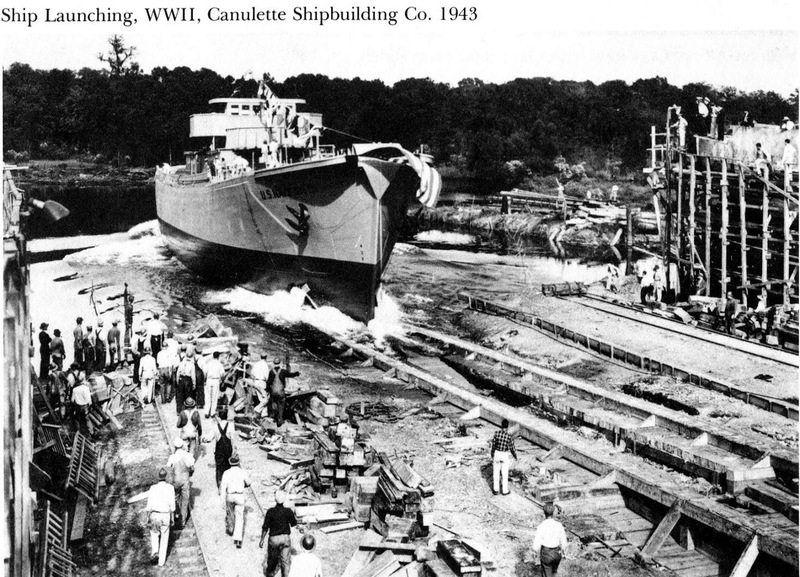 Thousands of men and women worked their daily, contributing to the well-being of the U.S. maritime fleet and warships when needed. 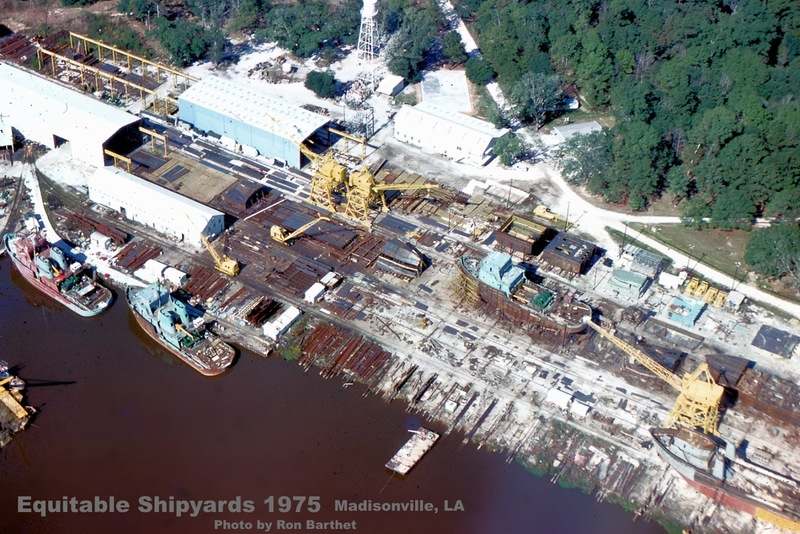 Here are some photographs of those shipyards.Click on the images to make them larger. Large Crowd On Hand To Witness Impressing Event. Miss Violet Heughan As Sponsor. 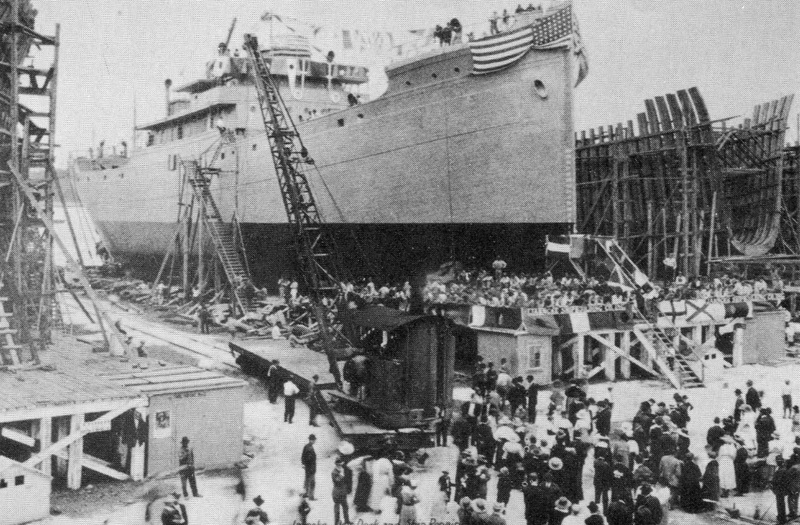 On Sunday, April 6th, the Jahncke Shipbuilding Co., Inc., launched the S. S. Pontchartrain, a 3500-ton vessel of the Ferris type. 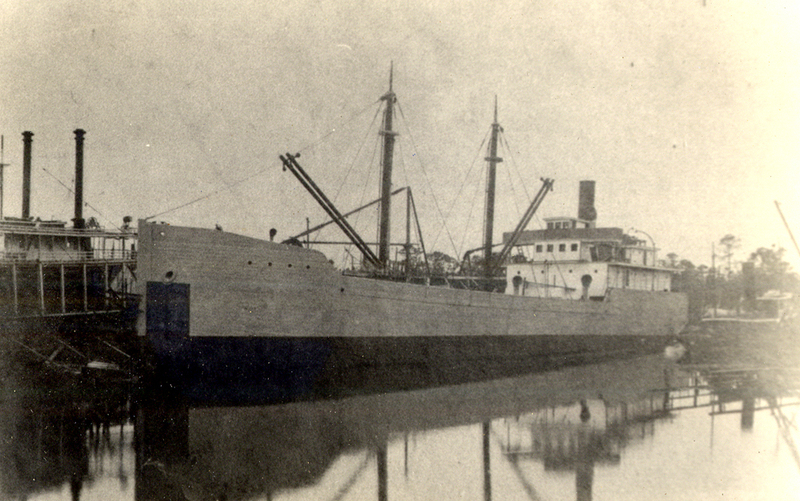 The Pontchartrain was the fourth ship of her type to he launched at the Madisonville yard. The yard gates were thrown open to the puhlic at 11 a. m. About 11:30 a. m. the great crowd began to gather. 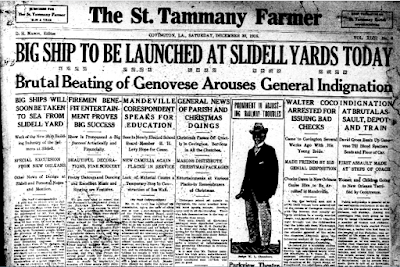 Pedestrians, automobiles, carriages and vehicles of every description were to be seen wending their way towards the ship­yard, and the eager throng of visitors which came from all sections of St. Tammany parish and surrounding parishes, new Orleans included, were admitted to the yard, and witnessed a sight which was an event that will undoubtedly be recorded as one of the most important in the history of the parish of St. Tammany. 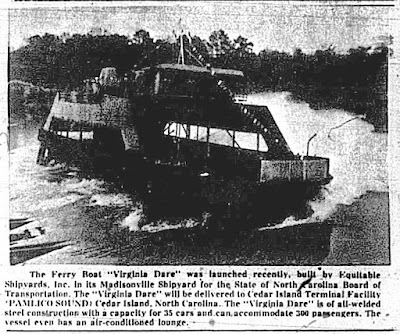 The Steamer Reverie arrived at 12 o'clock with her capacity of visitors from New Orleans. A band on board furnished delightful music. When she came up the river, with American flags flying fore and aft, and her bands playing (patriotic airs, it was a sight long to be remembered. So great was the demand of visitors from New Orleans that the tug Fox was called upon to tow the schooner Proteus over with a boat load of people. The Proteus also had a brass band aboard which played lively airs. The schooner arrived it 12:15, and the ceremonies began. Mr. E. T. Malloy, General Superintendent, was standing on the ways at the bow of the ship. He made an excellent speech preparatory to the presentation of a magnificent chest of silver to Commodore Ernest Lee Jahncke. Mr. Malloy spoke for the working force of the Jahncke Shipbuilding Company, when he said, 'The entire working force of the Jahncke Shipbuilding Company look upon Commodore Jahncke not only as an employer but a personal friend as well." When Mr. Malloy finished speaking he asked the crowd to give three cheers for their Commodore, and the cheers were loud and long. in the shipyard as the happiest ones of their lives, made so by the treatment received by them from Commodore Ernest Lee Jahncke, which was fair and square dealing throughout. The presentation of the chest of silver was kept a secret, and Commodore Jahncke was so surprised and overwhelmed with a feeling of appreciation he was at a loss as to what words he should use in order to properly convey his feelings. To say the Commodore appreciated the gift would be to say the least. 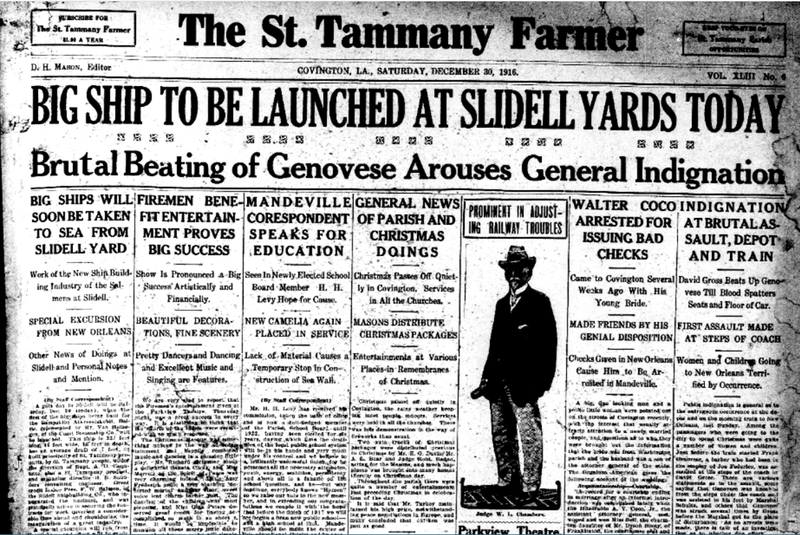 The Madisonville yard is an institution the entire country, especially the South, can well feel proud of, for it has been pronounced to be one of the finest yards of its kind in the United States. The officials of the yard have exercised great care in their selection of workers, and in the placing of various chiefs of the many departments therein. 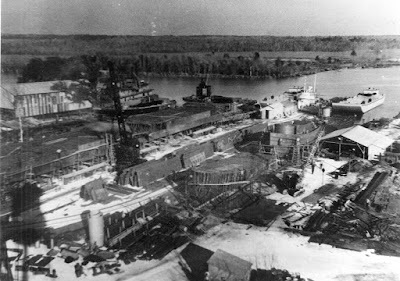 The slogan of the Jahncke Yard Is a sentiment which properly expresses the spirit in which the work is carried on:"We build ships here. At a profit if we can; at a loss if we must—but always good ships." And they were always good ships. In selecting Miss Violet Heughan, the winsome daughter of Mr. E. V. Heughan, the genial yard superintendent of the Jahncke Yard, a more appropriate sponsor could not be found. 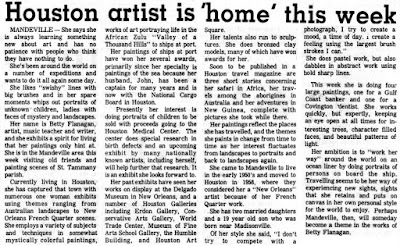 Miss Heughan, of Madison­ville, was born near the shores of Lake Pontchartrain and on the banks of the beautiful Tchefuncta, and she was beyond doubt one of the sweetest of sponsors, and when she broke the bottle of champagne on the bow of the Pontchartrain and spoke the words, "I christen thee Pontchartrain," her sweet smile radiated her beautiful face, then the great ship slid gracefully from her resting place to the bosom of the Tchefuncta. Those standing at the 'bow of the ship with Miss Heughan were Com­modore Ernest Lee Jahncke, Mr. and Mrs. E. T. Malloy, Mr. and Mrs. E. V. Heughan and Miss Kathleen Aby. Miss Heughan's dress was a champagne colored combination of georg-; ette crepe and taffeta, handsomely embroidered in dark shades of the same color. Her bouquet was of exquisite American Beauty buds,, tied with Uncle Sam's colors. Officials and Workers Proud of Their Magnificent Efforts. The officials of the Jahncke Shipbuilding Company, Inc., and the ship workers, can feel proud of the magnificent efforts they contributed to their Country's cause when the Huns, by their atrocities, forced upon our peaceful land the necessity of sounding the bugle call "To Arms." Let us again impress that the quality of workmanship furnished by the Jahncke Shipbuilding Company was of the highest grade. 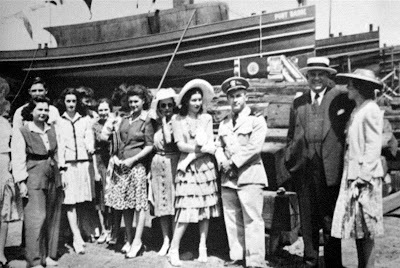 Every one of the New Orleans visitors profusely expressed their appreciation of Commodore Jahncke's furnishing them a day of enjoyment. The music and expense of getting from New Orleans to Madisonville was furnished by Mr. Jahncke. A day of pleasure was followed by a dance at the pavilion. good ship Pontchartiam, for that was the big day for St. Tammany, and all those attending the launching. There was an enormous crowd of people on hand for the big event and there was no place for a grouch among them. They were light-hearted, free and gay, and everything about the launching was likewise. From the time when the first auto drove up until the last visitor left, it was interest, enjoyment and good fellowship, all combined. And the girls—the beautiful girls! Ask them if they had a good time, and whether there ever was a better dancing floor than that at the pavilion. No one who saw the hundreds of couples that swayed through the maze of the popular dances would dare to say the launching was not a success from the time the gates were open until the Reverie and Aunt Dianh left for New Orleans, and the only unhappy moment was when the music stopped. 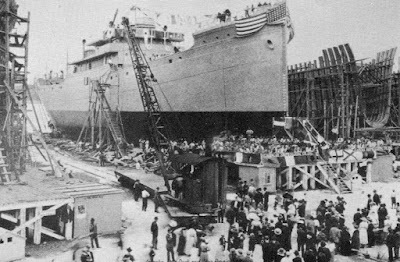 But that was short­lived for eagerly did the older, as well as the younger folks ask the question, "When will the next ship be launched?" According to Tim Colton, over at the shipbuildinghistory.com website, the shipyard in Slidell was originally established by Fritz Salmen in the 1880s: it became Slidell Shipbuilding in 1914 and Canulette Shipbuilding in 1919. It was sold in 1954 and renamed J. & S. Shipbuilding, then sold again in 1957 and renamed Southern Shipbuilding. 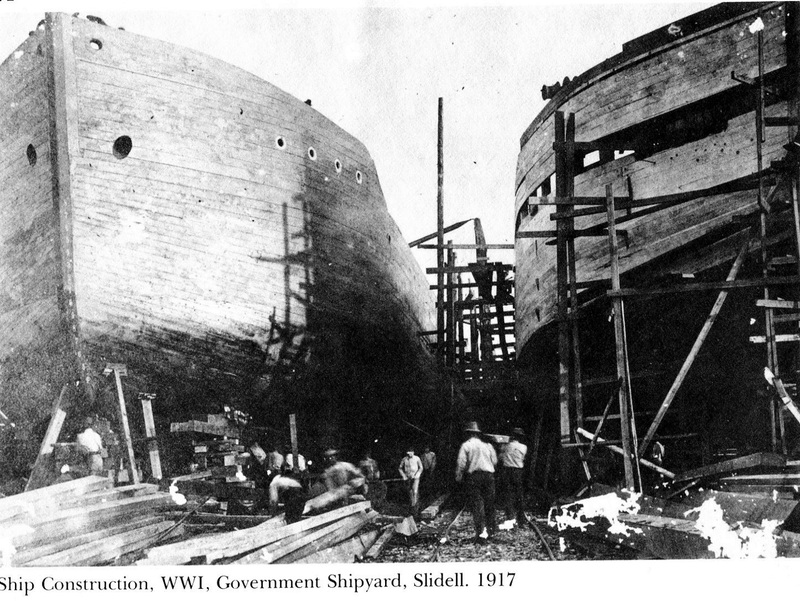 To see a list of ships built at the Southern Shipbuilding location, CLICK HERE. 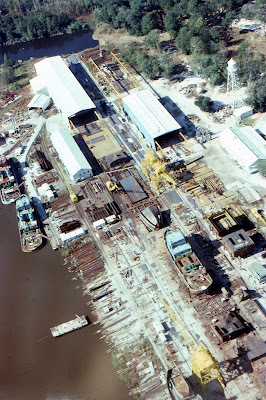 Southern Shipbuilding closed in 1993 and the facility has been razed. View of the office building at Louisiana Shipyard in Slidell. 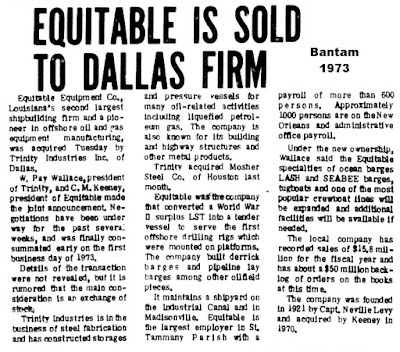 Equitable Equipment Company was the world's largest builder of LASH and SEABEE barges, building over 730 LASH Barges valued in excess of $35 million. 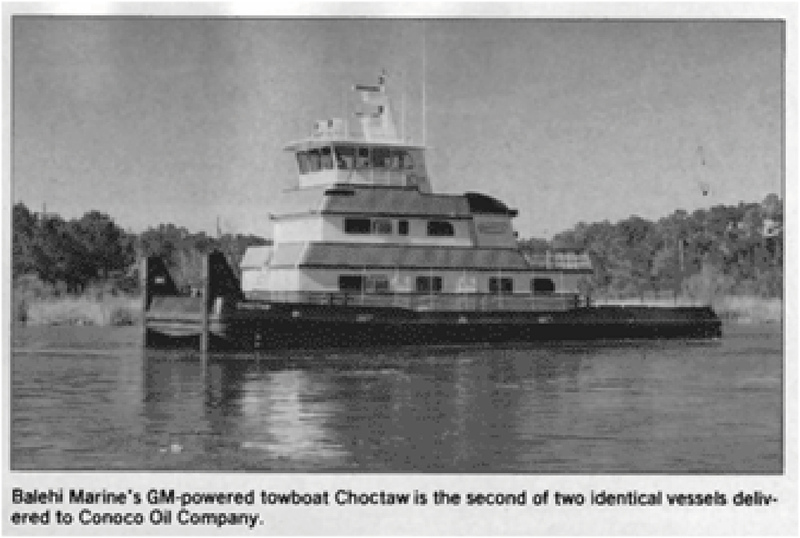 The company built various types of offshore support vessels as well, ocean-going tugs, tugs for harbor and inland waterways operations, self-propelled drilling ships, general purpose barges, and other marine equipment for the maritime and petroleum industries. According to Tim Colton over on the shipbuildinghistory.com website, "Equitable Equipment Company was founded by Neville Levy in 1921. In 1966, they acquired the former Higgins Industries yard on the Industrial Canal in New Orleans, which had closed in 1963, and began to build boats there, using the name Equitable Shipyards, while the Madisonville yard continued to build barges. 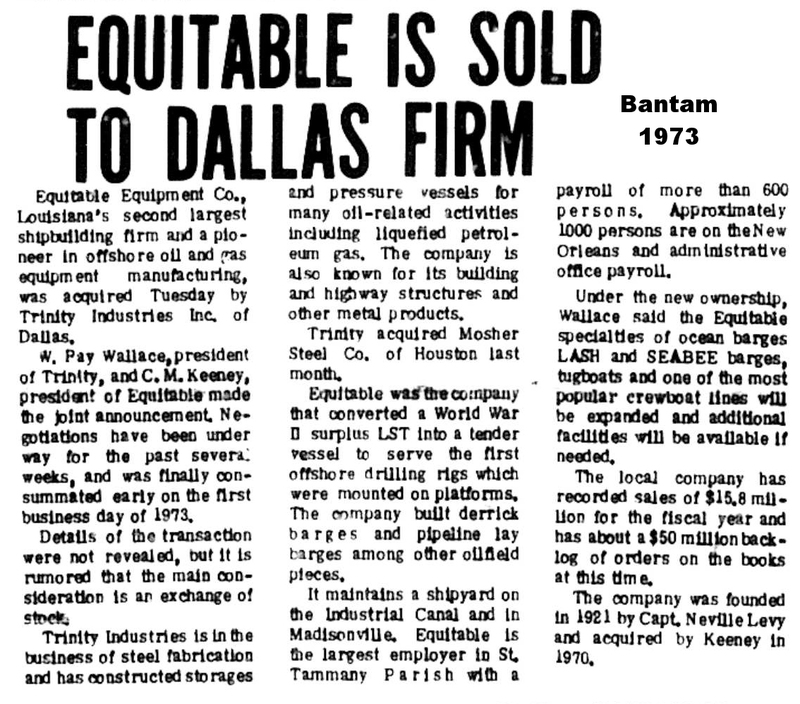 Equitable was acquired by Trinity Industries in 1972 and both yards continued in operation until 1996, when Trinity spun off the New Orleans yard as part of Halter Marine Group." To view a table that attempts to list all the barges built by Trinity in the Madisonville yard, CLICK HERE. 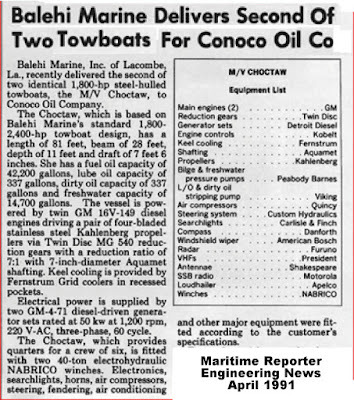 Also according to Tim Colton over on the shipbuildinghistory.com website, "Balehi Marine of Lacombe LA was founded in 1975 by David P. Levy, a graduate of the US Naval Academy who had worked at Equitable Equipment for 30 years. The company was unusual in that Levy, although the owner, filled the position of VP Engineering. 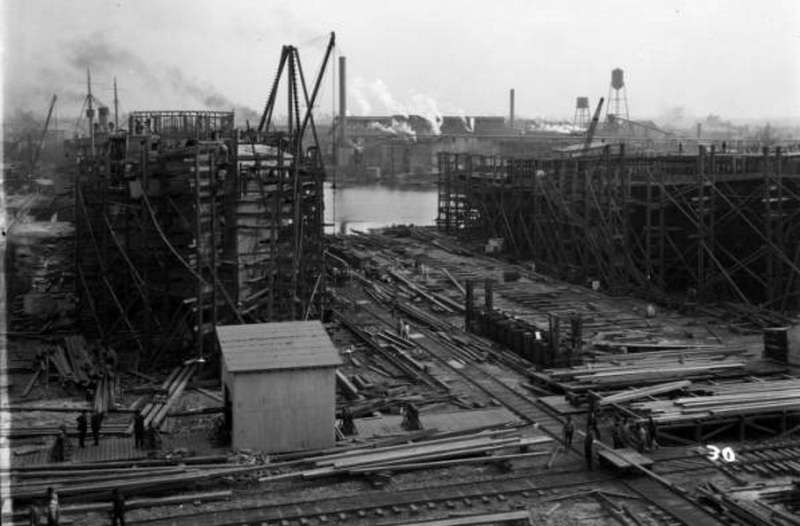 In addition, although small, they built boats in steel, aluminum and fiberglass. They closed in 1992. 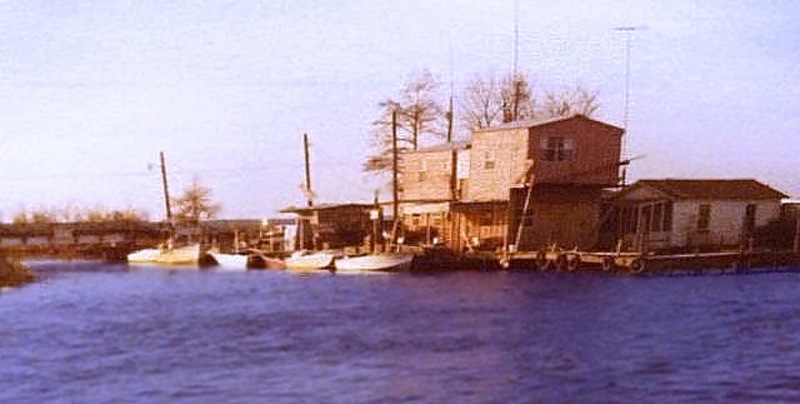 The yard even had an unusual location, way up Lacombe Bayou, north of Slidell, miles from a navigable waterway." 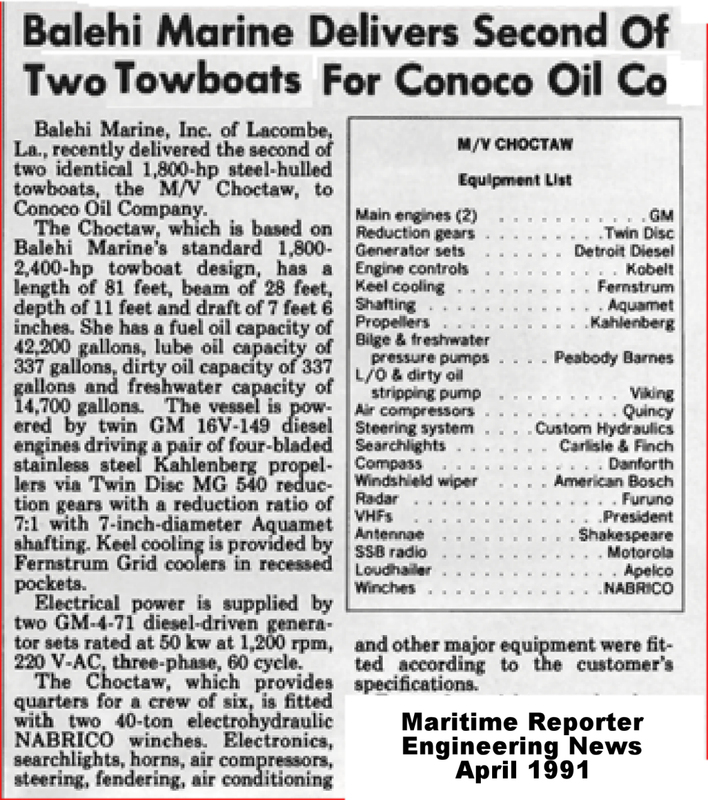 To see a list of ships that were built at Balehi Marine, CLICK HERE. 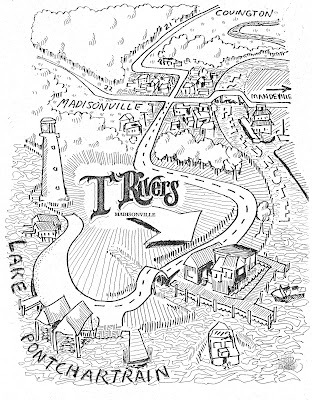 When TRivers was first opened on the southern end of Main Street on the Tchefuncte River in Madisonville, I was asked to draw a poster to help people find out how to get there. The drawing was to be printed on T-Shirts also. 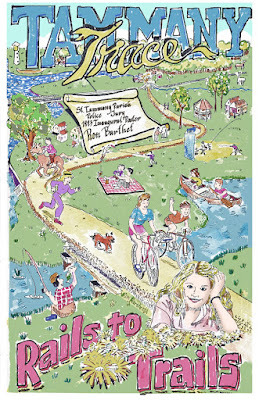 Here is the poster. 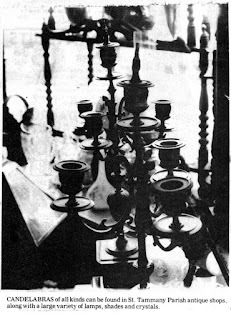 shown below in a photograph by Colleen Collier. The amount of work that goes into putting on a Mardi Gras parade is monumental. The crowds in the streets yelling "Throw Me Something Mister" have no idea of the planning, logistics, permits, last minute details, tree limb trimming and much more that all go into making the parade a possibility. Mardi Gras in St. Tammany Parish is no exception. But most all of the professional Mardi Gras floats that appear in dozens of parades in small communities across southern Louisiana have one thing in common, the floats are made in New Orleans. Those good-looking, well-built floats have to be retrieved from New Orleans, brought to the community in which the parade will take place, then, afterwards, brought back to New Orleans for the next scheduled small town parade to pick up the next day or two. 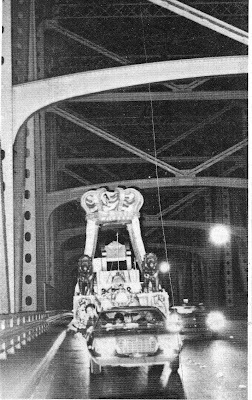 The Krewe of Olympia parade in 1972 got its floats from a well-known Mardi Gras parade float maker in Gretna, so the night before the parade in Covington, a huge number of volunteers drove across Lake Pontchartrain, through New Orleans, over the Mississippi River bridge and to the Mardi Gras float warehouse. 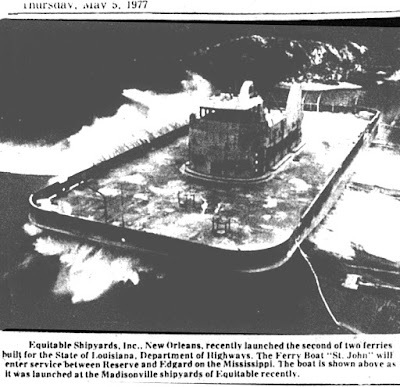 A couple of hours later, in the middle of the night, the floats were hooked up and off they went, back across the Mississippi Bridge (see below), through New Orleans, back across the Lake Pontchartrain Causeway and into the parking lot at the Bogue Falaya Mall shopping center. Lou Major Jr. and I, as news reporters for the Covington Daily News, decided to tag along on this adventure and take pictures. So below is the photograph of the King's Float, Olympia Parade, as it is being whisked across the Mississippi River at 40 miles per hour on its way north of the lake, where it will be the star attraction in that year's downtown Covington parade. I can't even imagine how, after the parade is over, that same group of volunteers help hook up all the floats again and run them back to New Orleans to the warehouse where they will be parked, inspected, and spiffed up for the next group from somewhere in the South to show up and haul them off to the next parade. 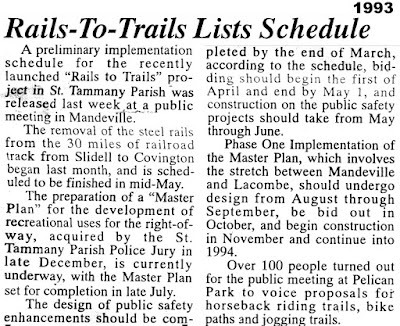 The efforts to transition the old railroad track from Slidell to Covington for public use was a slow, exacting and painstaking process. 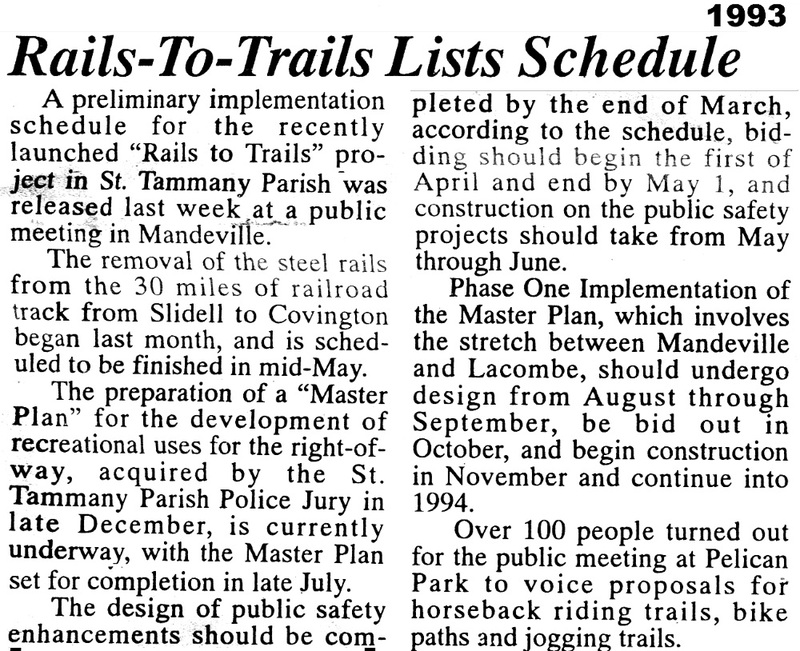 The federal Rails To Trails program was making it possible, but parish officials, Kevin Davis in particular, had to get a lot of ducks in a row to make it happen. 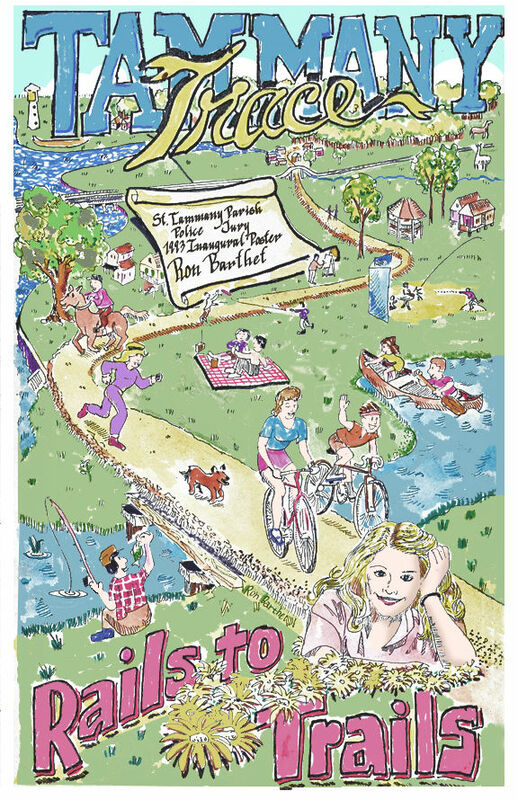 While the negotiations were going on, I drew a poster depicting some of the activities that would be popular on the old train track, activities such as jogging, walking, cycling, horseback riding, etc. Davis liked the picture, since it captured what the whole project was about. 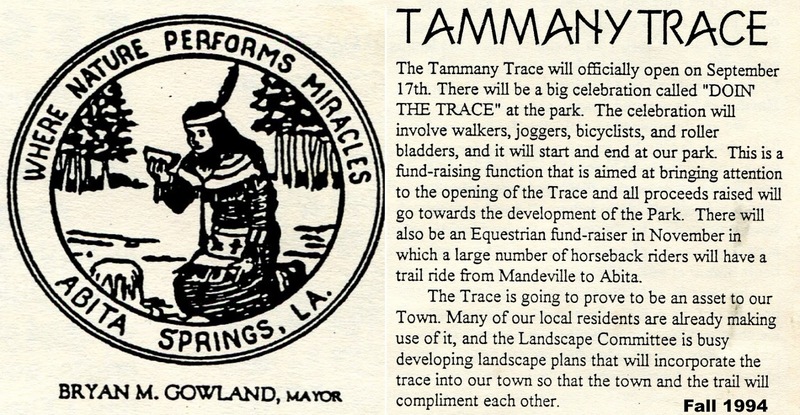 When the name Tammany Trace was chosen, it was decided to make the poster into souvenirs for the official name announcement ceremony. It was given away to several people as a commemorative item from the event. The Trace itself opened on September 17, 1994. "The Tammany Trace trail is located along the northern banks of Lake Pontchartrain, running west of Slidell, passing through Mandeville where it turns north to Abita Springs and then heads west again to end in Covington. 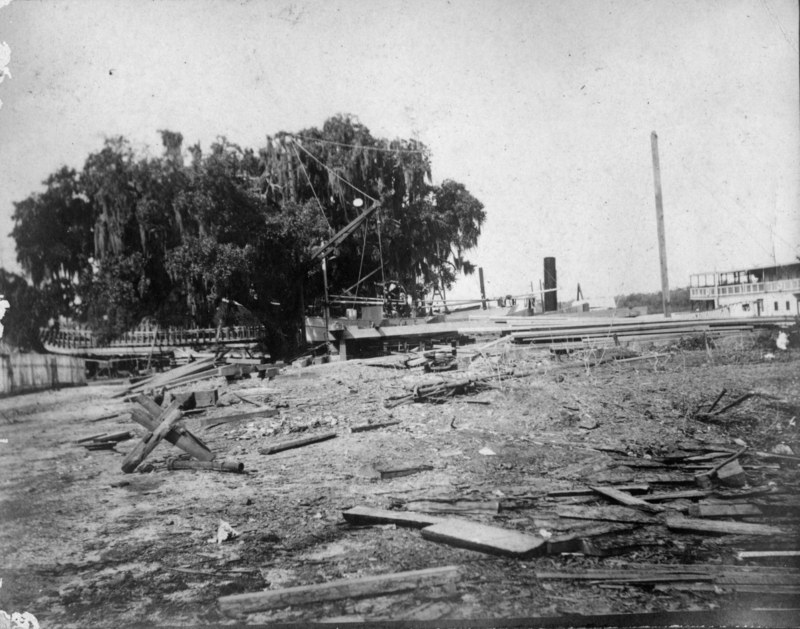 The old rail grade follows nearly 28 miles of right-of-way once used by the Gulf, Mobile & Ohio as a branch that split from its main line into New Orleans. The route has a deep history rooted in the timber industry, and for many years, traffic on the line remained relatively strong. New owner Illinois Central Gulf first attempted to abandon it, citing declining freight during the 1980s. 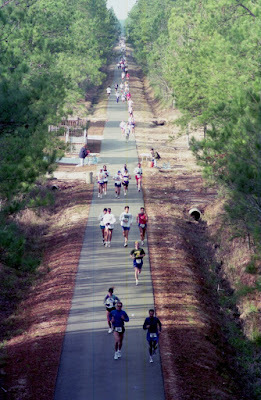 Eventually, and despite some backlash, the branch was finally abandoned during the early 1990s and turned into today’s rail trail. 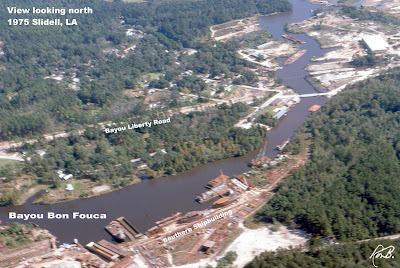 The history of the Gulf, Mobile & Ohio’s (GM&O) most southern branch begins in 1885 when the East Louisiana Railroad began construction from the main line of the New Orleans & Northeastern (later part of the Southern Railway) at Pearl River, connecting with Abita Springs by 1887, nearly 20 miles away. 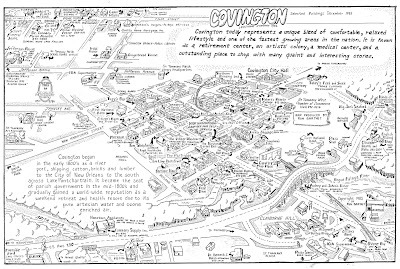 A year later it had reached nearby Covington. 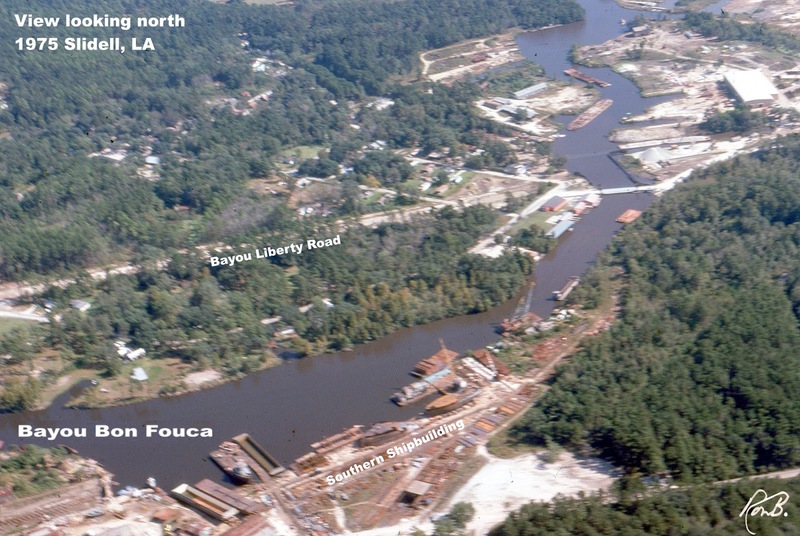 The railroad’s development was spurred by the growth of the town, thanks largely to the region’s rich tracts of timber, while its initial construction was funded through the Poitevent & Favre Lumber Company. 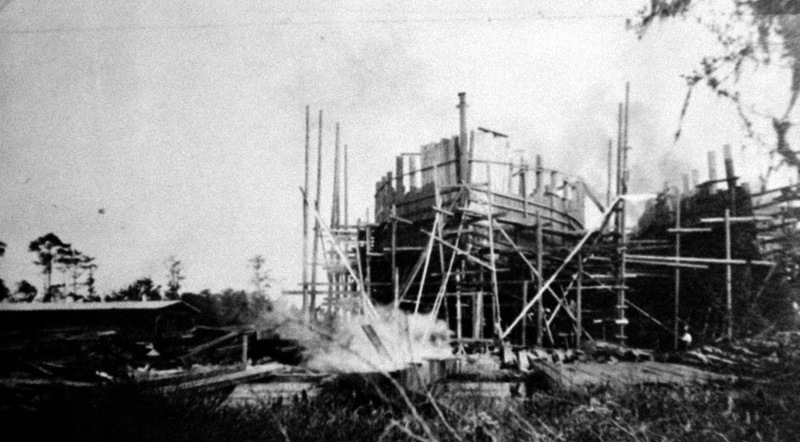 A few years after service had begun, a spur was constructed from St. Tammany to Mandeville, opening in 1892. Further growth continued into the early 20th century, including a new 13-mile line from Covington to Folsom completed in 1905, and the rise of passenger traffic when the town became a popular resort destination. It once boasted one of the South’s finest accommodations—the Southern Hotel. 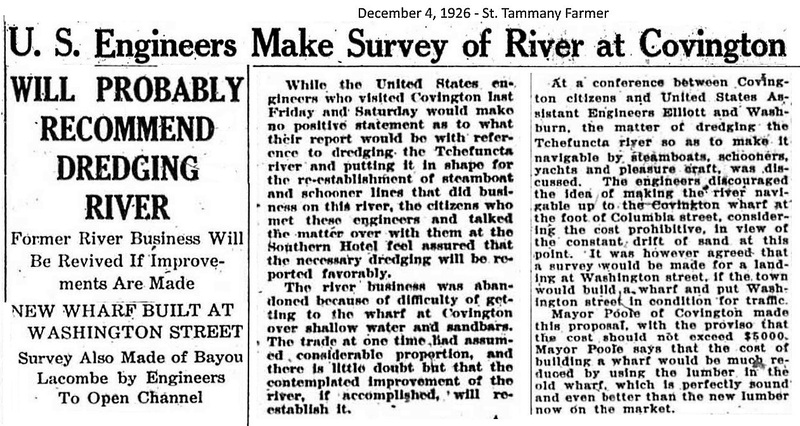 Interestingly, the grade now used by the Tammany Trace does not follow the original alignment to Covington. 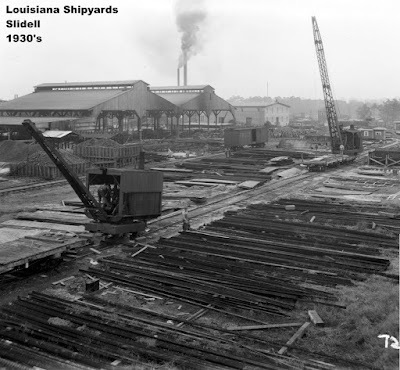 In 1905, the Great Southern Lumber Company purchased the East Louisiana and folded it into the newly formed New Orleans Great Northern Railroad (NOGN) to build a major route serving New Orleans and Jackson, Mississippi. 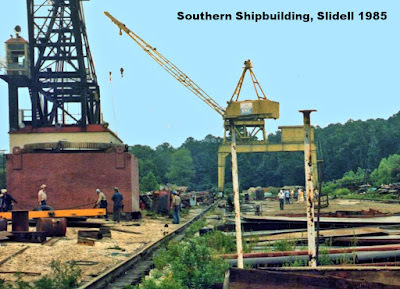 Under new ownership, an upgraded line was constructed to Covington and originating at Slidell along the NOGN. 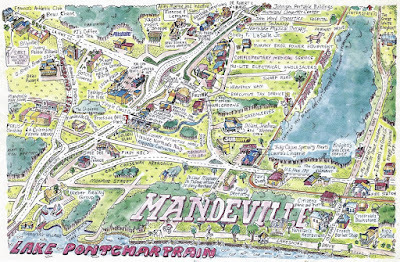 It ran via Mandeville, Lacombe, and Abita Springs. 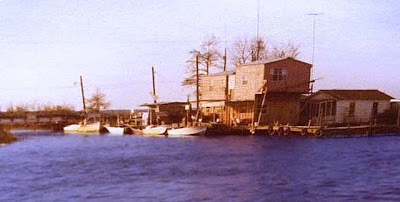 It was also known as the “Shore Line” and spanned a little over 40 miles. 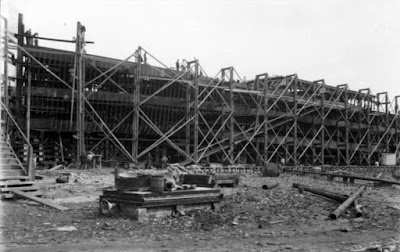 Following its completion, the original grade was abandoned. 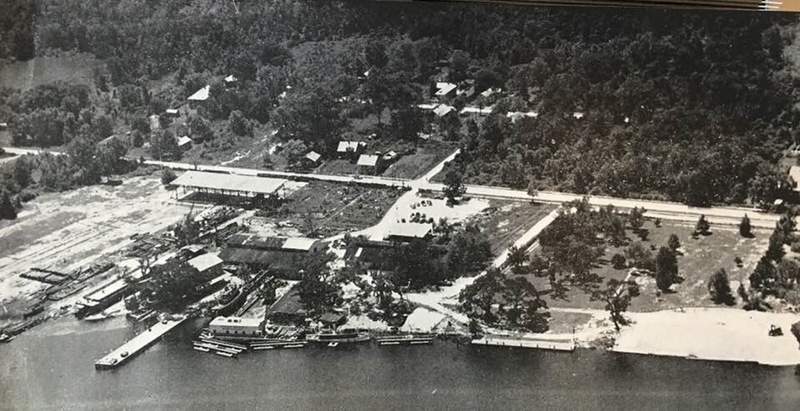 Through the 1920s, the line and resort prospered thanks to timber and the so-called health-giving ozone that the region supposedly provided to those suffering from various types of illness. 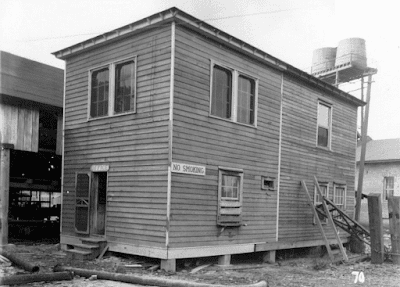 In 1929, the NOGN was acquired by the Gulf, Mobile & Northern; during the Great Depression, the Covington Branch saw its fortunes decline when timber was clear-felled and advances in the medical field rendered the region’s health benefits obsolete. 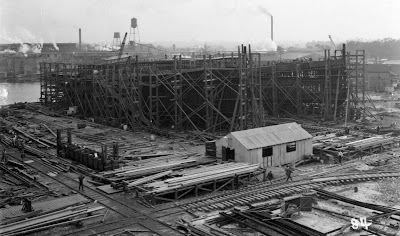 In 1934, Covington lost its western through-connection via the Yazoo & Mississippi Valley Railway, an Illinois Central subsidiary, which abandoned its line east of Hammond following declining timber traffic; it remained in use by local lumber companies until around 1970. In 1939, Covington lost all passenger service when the GM&N discontinued its remaining gas-electric “Doodlebug” motorized railcars. These gasoline-powered contraptions became popular at the time as a means of providing local passenger service while being less costly to operate than traditional trains. In 1940, the GM&N merged with the Mobile & Ohio to form the classic Gulf, Mobile & Ohio. Together, the two systems offered through-service from Chicago to New Orleans, cutting through the heart of the Midwest and South. The GM&O was unique in this manner, with only the Illinois Central providing a similar north-south trunk line (traditionally routes ran east to west). In 1947, the GM&O further expanded when it acquired the Chicago & Alton from the Baltimore & Ohio, allowing it to reach as far west as Kansas City. Other important connections included Memphis, Montgomery, Mobile, and Birmingham. Following World War II, freight over the Covington line was strong enough that it remained an important branch on the GM&O, although competition from trucks slowly ate away this traffic, especially following the opening of the Lake Pontchartrain Causeway from New Orleans to Mandeville. 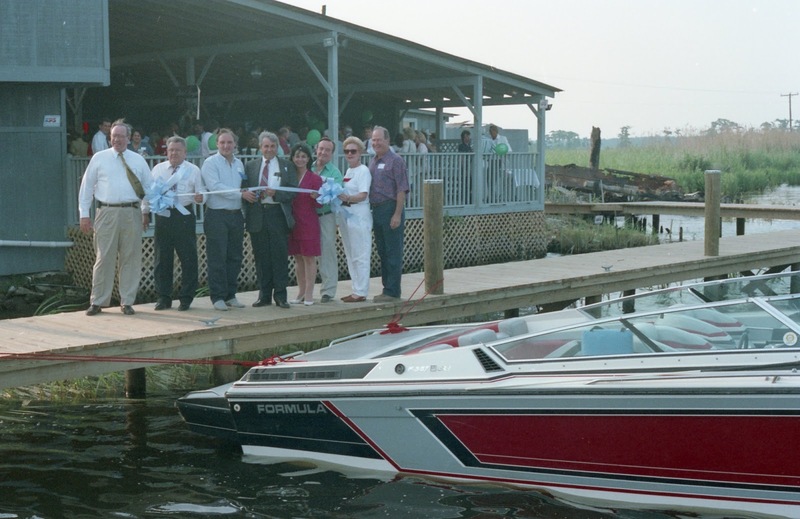 On August 10, 1972, the GM&O and IC merged to form Illinois Central Gulf (ICG). The idea behind the merger was to pool resources into a more efficient railroad; however, similar to the earlier Penn Central debacle, both systems closely paralleled each other, and the success of the ICG has often been questioned. In an effort to realize the benefits of the merger, ICG began abandoning hundreds of miles of duplicate and “excess” trackage during the 1980s under new management intent on returning the company to profitability. During this time the railroad was also eying the line to Covington for abandonment. In 1986, the company announced plans to discontinue service over the corridor despite a project that in 1981 had used federal funds to significantly upgrade the route. In 1988, the reborn Illinois Central (which had merely dropped the “Gulf” from its title) stopped providing service and was granted permission from the Interstate Commerce Commission to abandon the line in 1992. 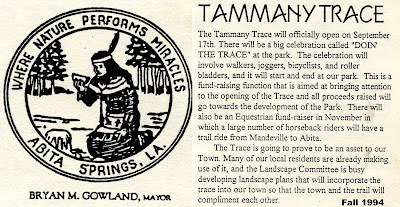 There were some efforts to keep it open but these failed to materialize, and the Tammany Trace Trail was born in 1993." 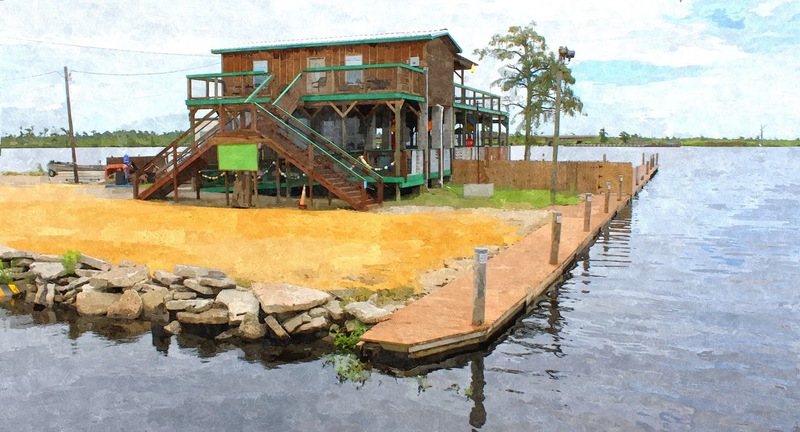 St. Tammany Parish is home to many artists with many styles and degrees of skill. 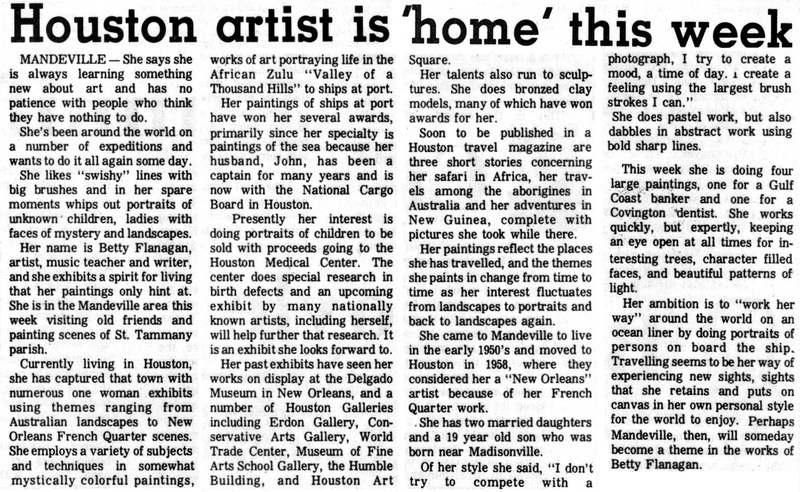 One of those artists who had moved away came back to the area for a visit in 1972, and here is her story. Click on the image to make it larger. Here is a link to her webpage. 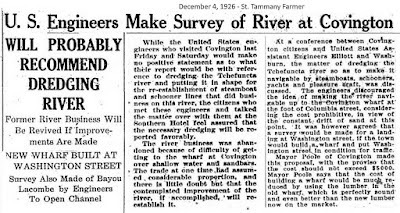 In 1926, citizens of Covington met with U.S. Army Corps of Engineers representatives at the Southern Hotel asking them to do something about the Tchefuncte and Bogue Falaya Rivers to make it possible for schooners and steamers to once again navigate from the lake to the town. 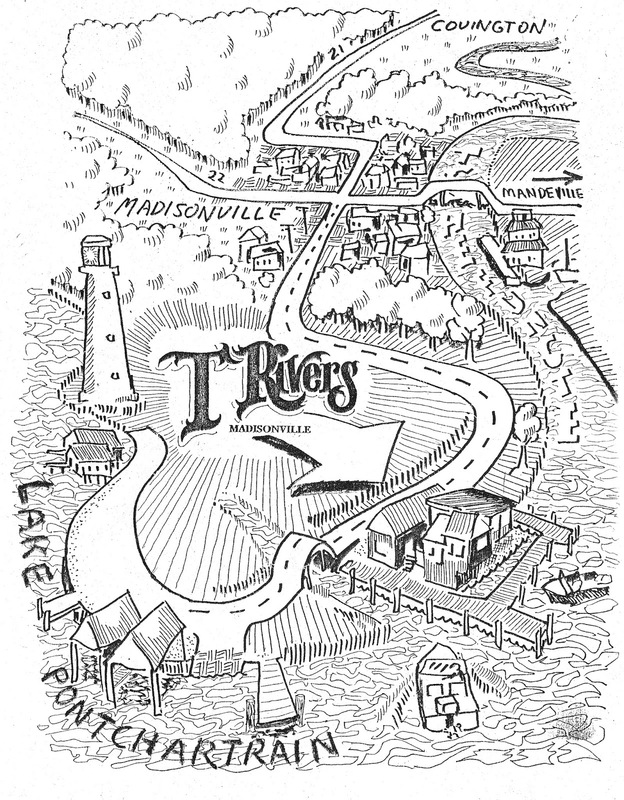 The rivers had gotten clogged to the point where boat service had been all but halted. Here is a newspaper article telling of that meeting. Click on the image to make it larger. 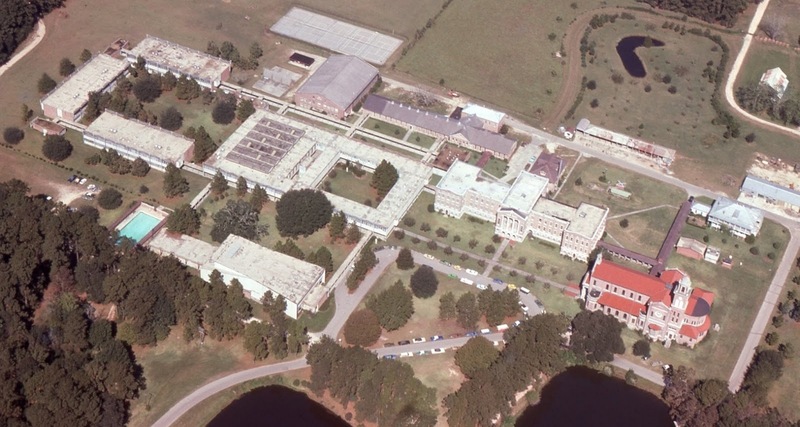 In 1975, I took an aerial photo of St.Joseph Abbey just north of Covington. Here is that photo. Click on the image to see a larger version. Here is a link to the present day aerial view of St. Joseph Abbey. Hmmm. Hasn't changed that much in 40 years. 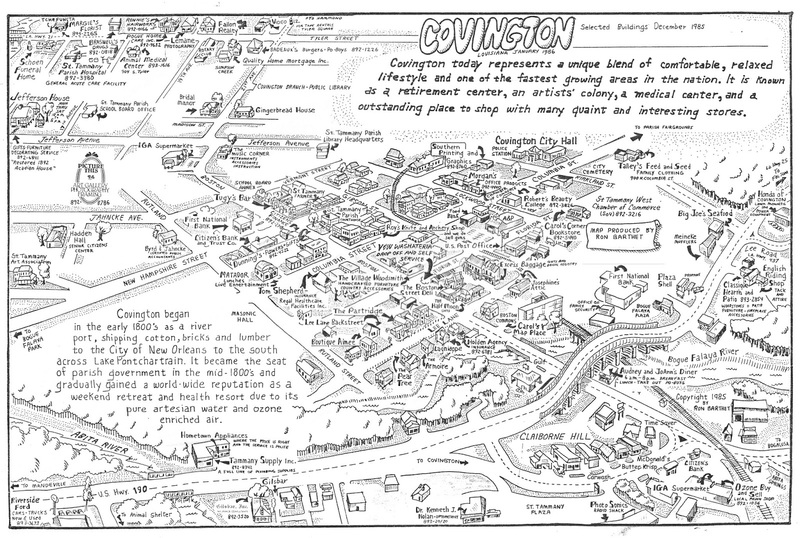 Here is the Covington area business map I drew in 1986. In addition to the downtown area, it showed Claiborne Hill and over to Tyler Street. Click on the image for a larger view. The World Famous Ozone Belt?